Travis Lupick (@tlupick ) is a staff reporter at the Georgia Straight. It was the middle of the night on November 25 when Barbara Carter was jolted awake by a fast knocking on her door. 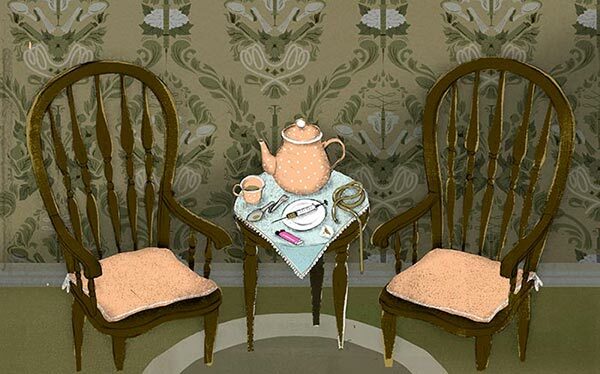 A small woman in her late forties, Carter lives on the eighth floor of the Regent Hotel on East Hastings Street. Even by the poor standards of Vancouver’s Downtown Eastside, it’s a decrepit building that can feel like there are more homeless people taking shelter in the hallways than there are tenants living in its small rooms. Carter’s unit is terribly cluttered. There’s barely room for her to lie down, with clothing and every sort of knickknack covering the floor, the walls, and evening hanging on strings from the ceiling. She called through the door to ask who was there. “Somebody was overdosing on the fourth floor,” she recounts during an interview in her room. “There was a young girl at the door, who said, ‘I don’t know what to do. You have to come do it. '” Children aren’t allowed in the Regent Hotel and Carter was startled by the girl who stood in her doorway. “She looked like she was like twelve or something,” Carter says. As a long-time drug user herself, she has learned to manage her own addictions relatively safely. In her room, Carter keeps naloxone, the so-called overdose antidote that’s used to reverse the effects of opioids like heroin and fentanyl. Upon entering the blood stream, naloxone seeks out opioid receptors in the brain and pushes drugs away from those connections, temporarily blocking their effects. Carter grabbed a kit—a small pouch resembling a sunglasses case that holds three vials of naloxone, three needles, rubber gloves, and a face guard for mouth-to-mouth resuscitation—and followed the girl down four flights of stairs. In a room, Carter found a First Nations woman, no older than twenty, lying naked in a bathtub filled with cold water. “She was turning blue and I wasn’t sure if it was from the water or from her drugs,” Carter says. 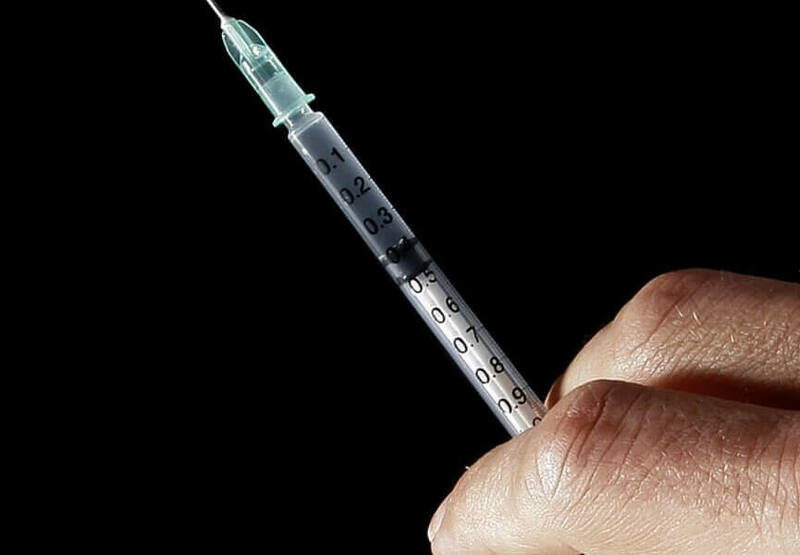 She took a syringe from her overdose-response kit, snapped the top off a vial of naloxone, filled the needle, and injected the girl in the muscle of her shoulder. A minute passed and nothing happened. Carter pulled the plug from the drain, jumped into the water, and began performing CPR. She loaded another needle with a second dose of naloxone and again injected the girl in her shoulder. Again, nothing. Another round of CPR and a third shot. Still there was no response. Carter is part of a shadow health-care system that has slowly developed in Vancouver since an overdose epidemic swept into British Columbia in 2011. 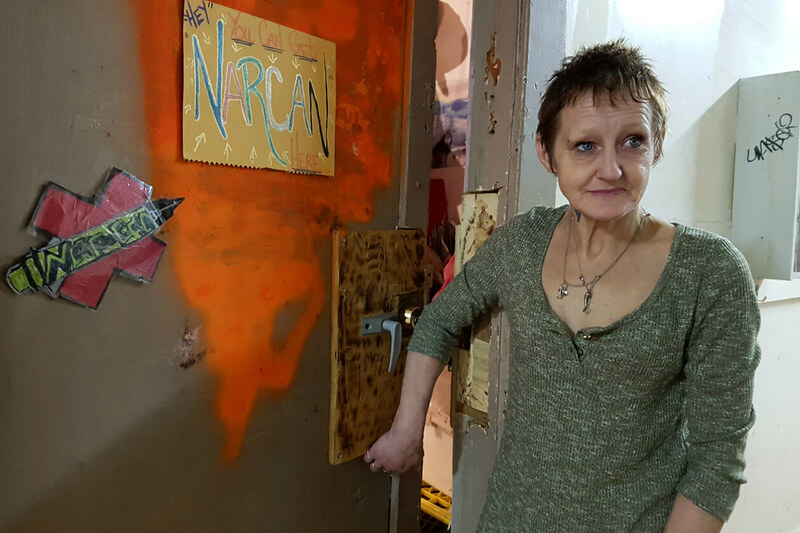 There are others like her in many of the Downtown Eastside’s hotels acting as de facto paramedics. Out on the streets, two unsanctioned supervised-injection tents operate outside the legal health care system, offering addicts a safer place to use intravenous drugs under the watchful care of volunteers trained in overdose response. 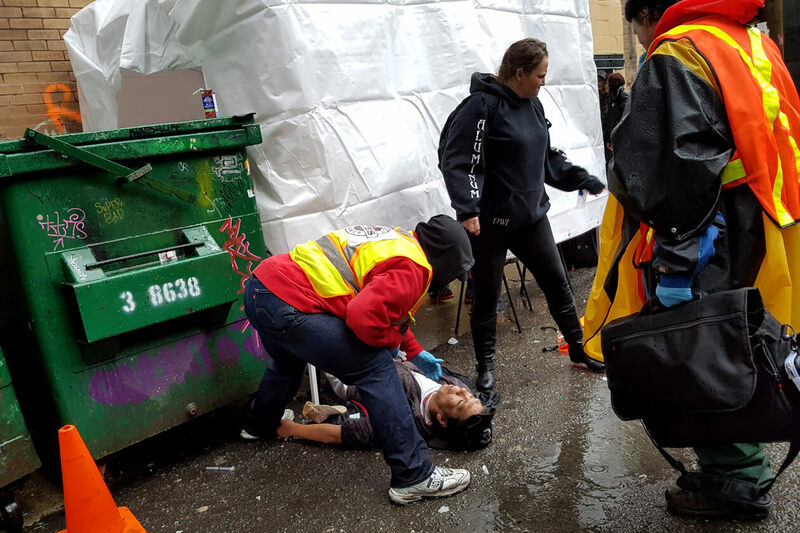 Drug users have formed foot patrols and bike teams that monitor the Downtown Eastside’s alleys, distributing naloxone and using it themselves when they find somebody in trouble. It’s a community response to the arrival of fentanyl, a synthetic opioid significantly more toxic than heroin. From 2000 to 2010, the number of illicit drug-overdose deaths in BC remained relatively stable, at an average of 207 per year. Then, in 2011, the annual death toll jumped to 292. It dipped slightly the following year, to 273, but then in 2013 rose again, to 330. In 2014: 370 people; and 510 in 2015. In 2016, it is projected that more than 800 people will die from illegal drugs in the province with more 60 percent of those linked to fentanyl. Over the weekend that followed, there were another seven deaths that Vancouver police classified as suspected overdoses. In four days, sixteen people had died of drugs in Vancouver, the majority of them in the ten square blocks that constitutes the Downtown Eastside. Something in Vancouver’s drug supply has changed to cause overdose deaths to spike above where the fentanyl crisis had already taken them. Toxicology tests won’t confirm an answer for two-to-three months, but officials suspect another synthetic opioid has arrived to Vancouver. Called carfentanil, it’s believed to be roughly a hundred times more toxic than fentanyl. Having lived through a similar epidemic in the 1990s, residents of the Downtown Eastside have taken matters into their own hands and are rallying to care for each other in the absence of government. There isn’t much to the supervised-injection site that Sarah Blyth established in September: a white canvas tarp draped over a steal frame. Underneath, there’s a semi-circle of tables and chairs. Near the entrance, there’s a stack of supplies for intravenous drug use: clean needles, a water cooler, and little dishes used to cook heroin, cocaine, or, increasingly, fentanyl. Watching over it all is a volunteer trained in overdose response and equipped with naloxone. Three months on, authorities have reluctantly given the operation tacit approval to continue. Vancouver police say they consider the tents a health-care matter and therefore won’t intervene. And while the BC Ministry of Health officially states it does not condone the tents, the minister paid a quiet visit on December 12 and thanked volunteers for their work. Blyth guesses the government’s tolerance for the tents is rooted in an acknowledgement that without them more people would die. When she started in September, there was one or two overdoses a day. “And then, all of the sudden, it was back-to-back overdoses. Or two overdoses at a time and situations that were completely chaotic,” she says. Fatal overdose statistics for BC are only specific to cities. But 911 call data for the Downtown Eastside supports the picture Blyth paints. For the one block that runs west from the intersection of Main and East Hastings, it shows that from January to August of this year, there was a relatively consistent monthly average of thirty-two overdose calls. Then, in September, that number jumped to seventy-four. In October, there were ninety-three, and then, in November, 155. At Blyth’s second tent, located in an alley off that block of East Hastings, a retired nurse named Sue Ouelette begins to explain why she chooses to donate her time, but a First Nations man using heroin drops from his chair. It’s raining, and the upper half of his body has fallen in a puddle outside the tent. Oulette rushes to him and injects naloxone into the muscle of his thigh. The overdose is caught early, and there’s no need to begin mouth-to-mouth resuscitation. Two minutes later, he slowly sits up. The next morning, back at the Washington Needle Depot, a pair of PHS peers—the organization’s term for past and present drug users it employs in frontline positions—sets off on bicycles. When overdoses spiked in November, Culbertson equipped teams with naloxone and fluorescent safety vests, and sent them out to patrol the neighbourhood. The program is called Spikes on Bikes. “They hand out harm-reduction supplies for folks who need them, and they also train people in the alleys on how to use intermuscular naloxone and how to respond to an overdose.” Culbertson says the initiative remains in a trial phase but is recording five or six overdose interventions every day. On December 19 the BC Coroner’s Service released the November numbers, which showed an increase in fatal overdoses had indeed continued. Forty-nine across BC in August. Fifty-seven in September. Sixty-three in October. In November: one hundred and twenty-eight.